I’m not usually one to re-post my own blogs, but it has recently come to my attention that the Zumba Fitness Total Body Transformation System DVD Set is once again available on Amazon. If you haven’t already caught on from my previous posts, I really love Zumba, and this is my favorite DVD set. You can’t get it directly from Zumba…it’s not available on their website. 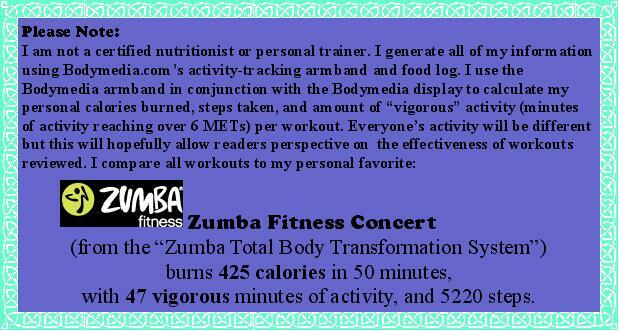 So I thought I’d let you know about this, and follow it up with a re-post of my Zumba-love post from November. Working out is just that…work. I’m not talking about running around with your kids, or playing sports at school. I’m referring to planned exercise that’s pure purpose is fitness, whether that be cardio or strength training. Sometimes I come across a workout routine that’s somewhat fun, or burns, burns, burns. And that’s great, except I really need more. Personally, I get bored easily, so I need a workout with a lot of challenges, variety, entertainment, and a high calorie burn so that the workout’s worth it. Tough bill to fill, huh? Enter Zumba . Zumba is the company name (think PX90X or Gaiam). It’s not a dance style, such as salsa or meringue (that confused me for a long time before I actually popped a Zumba disc into my DVD player). Zumba workouts have a mix of dance routines almost always set to Latin music. Beto, the talented but often cheesy Colombian that created Zumba, is usually the main instructor, with a team of other dancers leading you through the steps. That said, Zumba is not one of those simple dance DVDs that spends the whole workout “teaching” you a dance so that you can put the steps together at the end and only really burn calories for the last 5 minutes of the workout. Instead, each set of Zumba DVDs (usually 4 or 5 DVDs per set) has a special hour-long tutorial that teaches you the basic steps. Then they kind of just throw you in there with the workouts, and you follow along. Odds are, you’ll be tripping over your own feet the first couple of times you try this. But the steps are mostly repetitive, so you’ll catch on soon. There’s usually an assortment of music and dance styles from across the globe, so you really don’t even have the chance to get bored. There is salsa, samba, calypso, swing, and so on. The dancers are good (that helps), especially Gina. She’s not in all the workouts, but she’s always amazing to watch. That girl can really move, and I aspire to be more like her when I zumba (yes, I use it like a verb…but so do they, so…um, yes I’m falling for the marketing scheme). Most of the dance steps are based on tradition, so I often feel like I’m learning something. Cumbia, for example, is from Columbia, and it can really get you comfortable moving your hips around. Beto thinks he’s hot stuff and takes off his shirt all the time. I find that hilarious. You really need to take him with a grain of salt. He’s a wonderful instructor, and really, he’s come up with something great here. But English clearly isn’t his first language, and he sometimes acts like he’s a dancing Don Juan. As far as being considered “fun,” I’d say Zumba comes pretty close. You never stop moving, the moves are well choreographed with the music, and it’s all very upbeat. It’s still a workout, and can be pretty tough sometimes. After I had Ginny, I tried to jump right back in and found I really couldn’t. I had to tone my dancing down a bit and gradually build up to where I was pre-pregnancy. But that didn’t take me too long, and Zumba keeps you well enough entertained that you can put that kind of time and effort into it. Honestly, the DVD sets help with that. Since there are 4 or 5 DVDs per set, you can do a different workout every day. And they all basically use the same dance steps, so its interesting to dance the same moves in different ways. There are multiple Zumba DVD sets out there, but my favorite is the Zumba Fitness Total Body Transformation System DVD Set . You can’t get it directly from Zumba.com anymore, but if you search for it on the internet, I’m sure you can track it down. Sometimes Amazon carries it, sometimes they don’t. But this is the Zumba set I’ve used to test out the amount of calories burned per workout, and I’ve got to say, the numbers are impressive. My favorite workout, the Fitness Concert (50 minutes), burns 425 calories, has 47 minutes of vigorous activity, and gets you 5220 steps. Now for me, that’s really, really high. A 50 minutes exercise usually gets me around 300 calories burned, if I’m lucky. So over 400…bring it on! I tracked some of the other workouts as well. The Cardio Party (46 minutes) burns 352 calories, has 38 minutes of vigorous activity, and gets you 4409 steps. And the 20-Minute-Express workout burns 142 calories, has 15 minutes of vigorous activity, and gets you 2007 steps. So yeah, with that kind of calorie burn, the workout is definitely worth it. I highly recommend Zumba, even though it’s expensive. I’ve tried some of their other DVD sets too– the one from 2002 is kind of silly, and the new one, the Zumba Fitness Exhilarate Body Shaping System DVD Set , is pretty good. They also have video games, and most gyms with aerobic programs have a Zumba class. Those classes are gaining more and more popularity every day, but I’m told they really depend on the instructor. I’ve never taken one, but I’d like to someday.